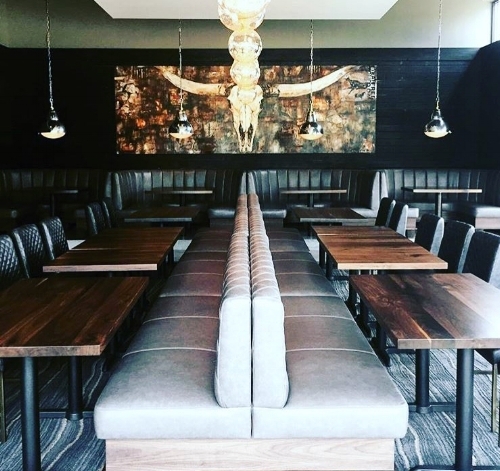 Located in a massive reclaimed warehouse off Apple Valley Road in Brookhaven, Arnette's is a modern expression of the classic American steakhouse housed in an industrial modern design atmosphere. The atmospheric goal of Michel Arnette and his fabulous team was to expose the natural character of the industrial space while blending vintage, classic and modern design influences. Michel and his wife Tonya have always been incredible supporters of local artists. So when they asked me to be included in their new venture I was beyond excited and honored. It's more than just a steak house. It is an experience. The Arnette's approach to dining is why all of their restaurants are so successful. “This business is called hospitality and there are so many people who have lost sight of that,” Michel says. “I think it’s a lost art. If you’re going to open a place to feed people in a social environment, don’t you think hospitality is the most important thing?” Yes we do and thank you!